Xi’an, China, 2019-Feb-02 — /Travel PR News/ — Renaissance Hotels, part of Marriott International, has announced that it is partnering once again with award-winning, Singaporean singer-songwriter Tanya Chua to redefine the brand’s signature Evenings at Renaissance program by showcasing her inspirations in travel and gastronomy. At the newly opened Renaissance Xi’an Hotel, this partnership features an exclusive invite-only performance by Tanya and offered a sneak peek of the benefits that the Marriott Bonvoy travel program will provide to its loyalty members. Brand ambassador Tanya Chua shares her experience as part of an online travelogue show named ‘Sweet Tooth’, which captures her journey uncovering different neighborhoods around the romantic French capital. Some highlights include taking in the French style garden design of the Renaissance Paris Le Parc Trocadero; showcasing a delicate dessert named ‘Breathe’ alongside the pastry chef of the Renaissance Paris Arc de Triomphe Hotel; and shaking up the unusual with a special cocktail creation by Renaissance Cocktail program global partner and internationally famous mixologist, JJ Goodman, at the Renaissance Paris Vendome Hotel. In one episode, Tanya also consults Renaissance Paris Republique Hotel’s Navigator lifestyle concierge for recommendations of charming local eateries not found in typical guide books. These and other discoveries will also be featured in ‘Sweet Tooth’, which was released online earlier this month on China’s popular Xiguan video platform. The show will also feature music from Tanya’s latest album. Tanya will also continue to showcase her culinary creations as part of ‘The Navigator’s Table by Tanya Chua’, featuring four cocktails and one dessert that were inspired by her songs at hotels across Asia Pacific. The Navigator’s Table is a dinner series showcasing the Renaissance brand’s focus on unexpected moments of discovery and inspiration through culinary journeys. The second series of the Renaissance Hotels’ collaboration with Tanya Chua was launched at the new Renaissance Xi’an. The event featured an exclusive performance by Tanya for special guests and loyalty members. This was a sneak peek of the benefits that members of the upcoming Marriott Bonvoy program will have access to beginning February 13 when Marriott Rewards Moments and SPG Moments will combine to become Marriott Bonvoy Moments, which together with Marriott Moments will feature approximately 120,000 experiences in 1,000 destinations available for purchase or by redeeming points. In addition to accessing locally relevant sights and excursions, members can indulge in once in a lifetime experiences including access to exclusive music, sports and culinary events. Marriott Bonvoy is a travel program designed to bring to life the combined extraordinary portfolio of global brands in 130 countries and territories, while also providing endless inspiration for members to keep traveling and pursuing their passions. The Renaissance Xi’an represents the sophisticated, 21st-century face of this ancient city. Xi’an is one of the oldest of the four great ancient capitals of China and is home of the world-famous Terracotta Army, dating back to the third century BCE. The new Renaissance Xi’an is the first Renaissance-branded hotel to open in northwest China, and it is strategically located next to Xi’an Qujiang International Convention and Conference Center, an easy 40-minute drive from Xi’an Xianyang International Airport. Renaissance Hotels design aesthetic welcomes guests in, encouraging to make each space their own. Look and look again moments engage guests, infused juxtapositions with high-low elements create a sense of true placemaking embracing the DNA of the locale. The interiors incorporate design elements that are inspired by the rich history of Shaanxi province, such as the terracotta roof tiles typical of traditional local homes used in the accent walls of the main lobby, and laid out to depict the majestic Hua mountain (one of the five great mountains of China); outdoor window elements reminiscent of traditional shadow puppets; and handwoven baskets transformed into clever light fixtures. Celebrating the spirit of the neighborhood, Renaissance Hotels connects you to the destination; transporting guests through an unexpected design aesthetic, to a place where skilled Navigators welcome you in and evening rituals encourage travelers to mix with locals. The hotel’s knowledgeable Navigators are always ready to assist guests in discovering Xi’an’s many treasures, as well as its spectacular surrounding mountains and garden landscapes. Renaissance Hotels believes in fueling guests’ imaginations and exciting their senses when they travel to new destinations, providing unexpected experiences that go beyond the conventions of business or leisure travel. At the Renaissance Xi’an, visitors to this beautiful ancient city are bound to leave with stories of inspiration and insights that are worth retelling. With over 160 hotels in more than 35 countries around the world, Renaissance Hotels has hit its stride with the strongest hotel portfolio in its history, doubling down on its commitment to design with dramatic renovations and dynamic global growth on the horizon. Around the world, Renaissance Hotels connects travelers to the spirit of the neighborhood through its unexpected design, entertaining evening bar rituals and engaging Navigators, extending an open invitation to experience the unexpected both inside and out of the hotel. Stay connected with Renaissance Hotels on Facebook, Instagram, YouTube, and twitter @RenHotels. Renaissance Hotels is proud to participate in the company’s award-winning loyalty programs – Marriott Rewards®, The Ritz-Carlton Rewards®, and Starwood Preferred Guest® (SPG). The programs, operating under one set of unparalleled benefits, enable members to earn points toward free hotel stays, achieve Elite status faster than ever, and seamlessly book or redeem points for stays throughout our loyalty portfolio of 29 brands and more than 6,900 participating hotels in 130 countries & territories. To enroll for free or for more information about the programs, visit members.marriott.com. Singaporean Tanya Chua is a spunky singer-songwriter renowned across most of Asia. 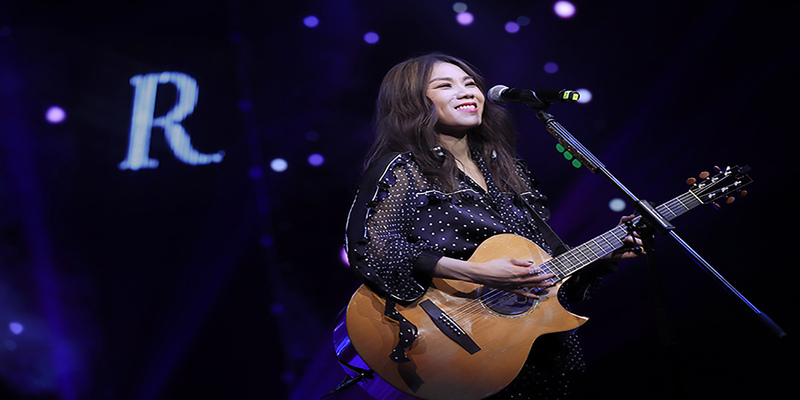 Since her debut in 1997, Tanya has released more than 16 albums in Mandarin and English and has written over 80 songs for her fellow Mandarin pop singers. Tanya was awarded Best Mandarin Female Singer in 2006, 2008 and 2012 at the Golden Melody Awards – considered the Grammy awards in the Chinese-speaking world; and Best Local Artist twice at the Singapore Hit Awards in 2008 and 2009. Her talent does not only stop at music. Not known to many is her passion for desserts, even completing a three-month course at a boutique cookery school in Paris. This entry was posted in Business, Entertainment, Festivals and Events, Hotels, Luxury, Resorts, Travel, Travel Services, Travelers and tagged Andy Kong, Marriott International, Program, Renaissance Hotels, Tanya Chua. Bookmark the permalink.